When working at heights, safety has to be a major consideration, that can help you to avoid accidents and falls, which at times can be fatal or cause permanent disabilities. Working on roofs or from ladders can become a fall hazard and can be made more dangerous when working surfaces are wet from rain, snow or dew. Work at heights becomes all the more danger prone during high wind conditions that make for difficulty in handling material at heights. Safe working on roofs can be ensured if you wear the proper safety gear and harnesses and ensure that you are always firmly anchored to a permanent structure on the roof that can arrest any fall or slip. Make sure that you have someone who can assist you in the work, and more importantly serve as a lookout for bystanders or pedestrians that can come into the danger zone while you are working on the roof. Make sure that roof is not wet, and if it is, give it time to dry before you step on it. Always wear a bag or have pockets for the tools that you need to carry while working on a roof. Never move around with a tool in your hand, and keep it safely in its place, before you need to move. See if you can create or place firmly fixed boards on the roof that you walk around on when you need to move around for inspection or repairs to the roof and its various elements. Climbing on roofs will require you to use ladders, and you must be equally attentive to the safety aspect of using ladders. Roof ladders that have hooks on the top end allow you to anchor the ladder to firm parts of the roof. They will prevent the ladder from moving while you are using it. Ladders must be locked into place before you use them, and the ground on which they rest must be solid and firm. There must be no obstacles that can obstruct you while climbing. Never climb to the full extent of the ladder, and have a ladder that allows you to work from it or dismount from it, while you are still able to grasp the sides of the ladder. If your ladder has no hooks, make sure you tie the ladder firmly to some support. 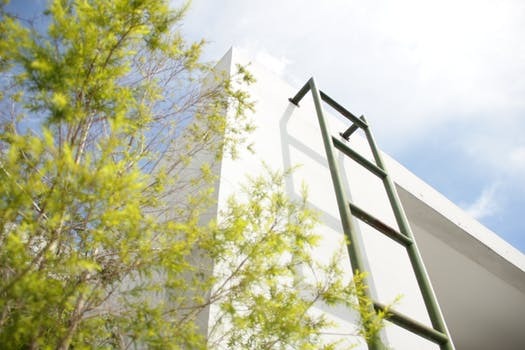 Ladders that are very steep can be difficult to climb on, and when you choose a ladder, get one of a length that is more than the height that you need to climb.